DUMBARTON paid their first ever visit to New Dundas Park to play top East Junior League side Bonnyrigg Rose, and were lucky to escape with a 0-0 draw. DUMBARTON paid their first ever visit to New Dundas Park to play top East Junior League side Bonnyrigg Rose, and were lucky to escape with a 0-0 draw in front of a 1,552 crowd. Stevie Aitken's men never really found the right gear against a tough, determined Bonnyrigg Rose in the William Hill Scottish Cup third round tie. The home side had the best of the early exchanges and looked more comfortable for most of the first half, despite the increasingly angry shouts from the Sons boss. Keeper Alan Martin made a couple of important, quality stops, while at the other end there was a good double save from Rose goalie Michael Andrews, coming out quickly to deny first Garry Fleming then Donald McCallum. Just before half time Andy Stirling clipped in a cross which the keeper spilled. McCallum picked up the rebound but was denied once more. After the break Dumbarton started to apply more pressure, but looked decidedly vulnerable on the break. 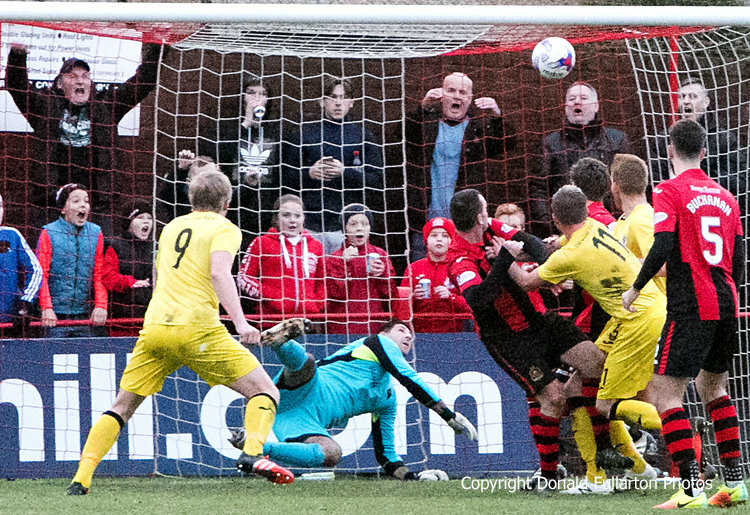 Martin made several more outstanding saves as Bonnyrigg scented the chance of nicking a famous victory. In the end Sons held out until the final whistle. But Rose put in a fine, gutsy performance and fully deserved the draw and replay, while Dumbarton never showed the quality they have.